If ever there was a silver lining for the 2014 Red Sox season, it was that plenty of prospects got to show their stuff at the next level. For some, that was a chance to shine on the brightest stage with the Major League club. For others, it was an opportunity to advance to the next level of the Minor League system. A couple interesting players here, such as Margot, who has burst onto the scene with a .462 OPS between Salem and Portland with 12 homers and 42 stolen bases. Margot has big-league potential as a five-tool player and his progress will be fun to watch over the next few years. 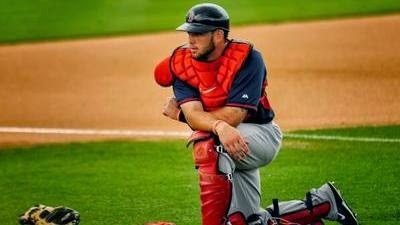 Now that we've seen Vazquez behind the dish, you have to wonder what the Sox plan is with Lavarnway and Swihart. One is likely to be trade bait (see: Lavarnway). The other (Swihart) is too good to platoon in Boston. Of course, it appears the Sox want to see Swihart for one season in Pawtucket before calling him up for good. What would that mean for Vazquez? Guess here is it all depends on the type of season he has. Cecchini is arguably the closest to taking away Will Middlebrooks' spot at third base for Boston. Ben Cherington has mentioned the need for a lefty power bat, and well, Cecchini is just that. Pitching is a premium on the farm. The Sox have gaps to fill this offseason for the Major League rotation, but there is plenty of depth at the Triple-A level. There are four names on the list above currently on the PawSox roster. Include Barnes, Ranaudo, Webster, De La Rosa, and Workman, and it's easy to see that the Red Sox will have a large pool to choose from in Spring Training. Kudos to Cherington and Co. for stocking the farm with plenty of talent. The "future" we longed for has just about arrived. Your time to shine, young'ns.